Sticking with my resolve to hang things up in the new year, I thought I would give you an update on my hook hanging mission. 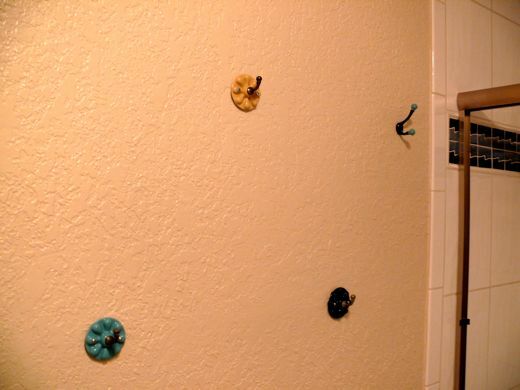 Okay, so the first day I attempted to hang hooks, I was utterly foiled. 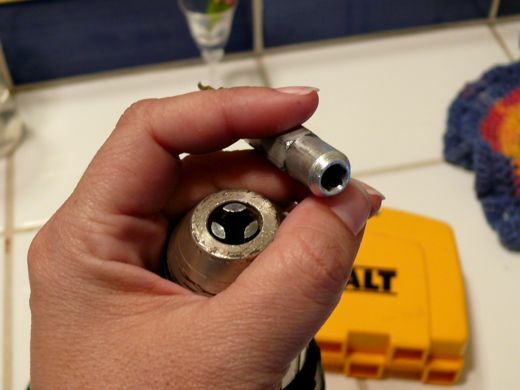 ... chucks, bits, drills, screws, and how to make one part fit into another. It seemed too simple to undo me, but I was indeed undone. Even my urgent call to Geoff yielded no answers. He was a bit "busy" at "work" where he goes everyday, for "work." Very inconvenient. So, day one was a bust. This is the wall I wanted to tackle. This is both a guest bath, and the bathroom the boys use, so I am constantly in a battle process of teaching the guys to keep it gorgeous. It seems systems of order must be simple. Simple is good. Simple helps. 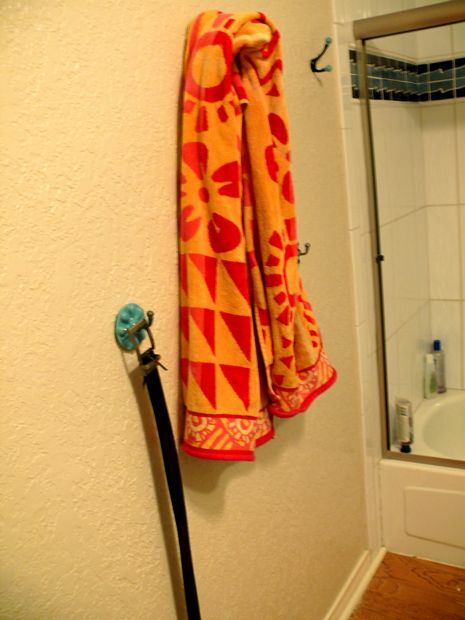 Simple means that a towel bar is silly, because it can barely hold two bath towels, it requires a higher level of folding-hanging ability than some people are willing to apply, and it just looks meh in our circumstances. Our we are too laid back and mellow to hang tidily folded towels circumstances. Here is our new... wait! And here is the new bathroom wall. 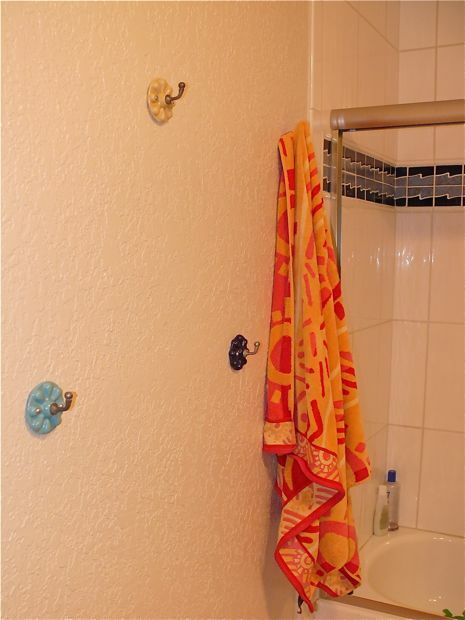 At the far end, near the tub, is a convenient towel hook. 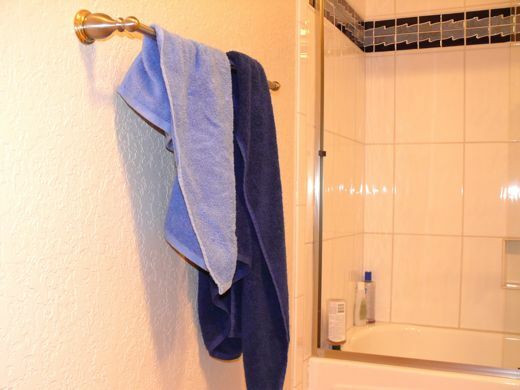 Easy to grab a towel as the bather emerges from the shower. The three flower hooks are for clean clothes they will be putting on. 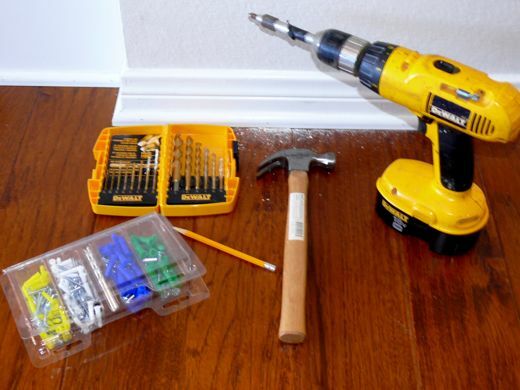 Now clean clothes don't have to hang out on the counter, or floor, or be stuffed over the old towel rack. Ideally, the patrons of this fine establishment will recall that I ask them to take their towels to their closet, and hang them in there... the idea being that there will be no towel mix-ups, and the windowless bathroom will not be overcome by three humid towels. I think it will also help with the whole keep it gorgeous objective. Ah, this is so theoretically marvelous, in my mind. And okay, so it's not a decorating hoopla of refinement and aesthetic Marthaism, but it's better, I think. There is potential, room for art, and I feel a sense of contentment, because even if it is still meh, it is my very own, created meh. I am hooked. Go for it! I feel so empowered and liberated. And I keep seeing more places where there is a need. Facing our laziness and finding a possible solution is a good step forward. Although, I am imagining in fifty years, when some other family moves in and they shake their heads and wonder: "Why were they so CraZy about hooks?!"